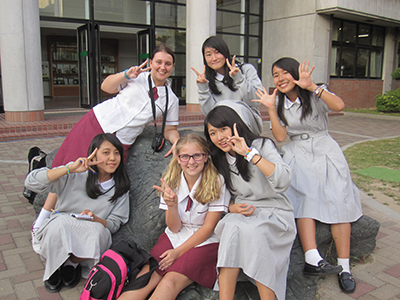 A group of students and teachers from our sister school in Australia, St. Mary’s College Ipswich, visited Nigawa on September 29th as part of their Japan tour that takes place every 2 years. The group was comprised of students who study Japanese and have a keen interest in learning about Japan in general. Each student was assigned a “buddy” for the day who introduced the visitors to many aspects of the Japanese school day that are not part of their routine in Australia, including chorei, shurei and classroom cleaning. Moreover, there were opportunities to take part in classes with Nigawa students and, of course, a little time to catch up with their senpei, Anna, currently on a one-year exchange with us from St. Mary’s. Some of the students have expressed their hopes to follow in Anna’s footsteps by coming here again on a long-term exchange, and we look forward to seeing them again soon.